Flying the Sri Lankan Naval Ensign on top of Mast of Sri Lankan National Chess History. 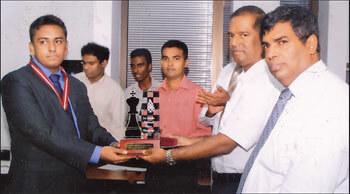 Ordinary Seaman Isuru Alhakoon, a member of Sri Lanka Navy Chess Team, became the Sri Lankan National Champion on April 1, 2012 at the 38th National Chess Championship 2012, conducted at Etisalat Auditorium, Colombo 04, from March 23 to April 1, 2012. Navy's Isuru Alahakoon receiving the Championship trophy from CEO of Etisalat Dumindra Ratnayake. Sri Lanka Navy Chess Team launched into the tournament with the Blessings of the Secretary of Defence Gotabhaya Rajapaksa and with the Best wishes and Directives of Commander of the Navy Vice Admiral Somathilake Dissanayake. The team was navigated by Captain S U Dampage, who chairs the Navy Chess Team and over the course of the last three days of toughest endeavours within the peaks and valleys of the waves. The Sailors defeated almost all the reputed players including first FIDE Master and noted chess coach Sunil Weeranmantry and Defending National Champion Chamika Perera. Navy's team also included former National Champion G C Anuruddha, Prasanna Kurukulasuriya, Chandana Wijekoon and Osheen de Silva who has anchored the sailors for the past few years. Isuru Alhakoon and G C Anuruddha from the Sri Lanka Navy are also privileged to sail to represent Sri Lanka at the World Chess Olympaid on August 24th and Isuru Alahakoon, G C Anuruddha, Chandana Wijekoon, Prasanna Kurukulasuriya and Osheen de Silva from Sri Lanka Navy will also sail to represent Sri Lanka at the Asian Zonal 3.3 Chess Championship.